So you have decided to take up snorkeling, great job! The only thing is telling people what you saw will never paint as complete of a picture as well… Taking a picture! While there is no one best snorkel cam there are plenty affordable options that you can choose from to get yourself in the water and snapping pics in no time! If you are just going on vacation and want to snap pictures take a look at our best waterproof cameras for snorkeling that are disposable. I should note that these cameras reviewed are for beginner to intermediate snorkelers who want to snap a photo up to 30 meters. Anything more and you should look at Scuba Diving Cameras that comes with waterproof housings. The cameras reviewed are the beginning step into the underwater photography world that are durable, affordable and allow you to keep memories from your trip. Eventually should yourself becoming a hobbyist of underwater photography you can upgrade to proper dive cameras that scuba divers use. Why choose an Underwater Camera? selecting the top underwater camera for you depends on what you are using it for. If you are just going to a one off vacation and want to take pictures of your snorkeling trip there is no need to buy a temporary camera for $300 +. There are lots of disposable underwater action camera options out there that are between $30- $60 that you don’t have to worry about. If you are getting into snorkeling, (chances are you will be doing more snorkeling trips after the first one) then it’s time to look into a good quality underwater camera that won’t cost you an arm an a leg. 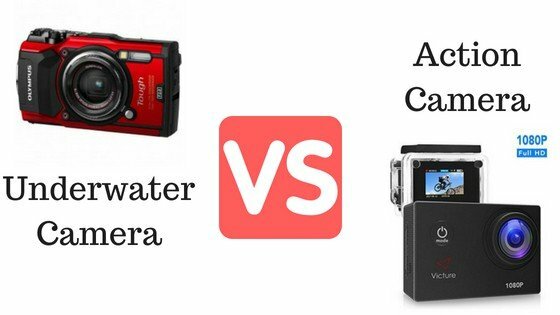 Waterproof Camera or Action Camera? So how does this all relate to snorkeling? If you are taking up close shots of say a fish playing around an anemone a go pro would perform as well as a waterpoof camera. If you are taking pictures of things from a distance, say a barracuda patrolling the reefs you would want to use an action camera because of it’s higher quality shot potential and better zoom lense. I don’t know about you but I would much rather give a respectable ocean predator like a barracuda more space to do it’s thing then rush it to try and get a better shot. One of the biggest reasons why people go to compact cameras is well, because they are compact! A lot of snorkelers cannot be bothered to bring a whole range of gear, housings, lighting ect. They just want to dive, take some pictures and have something that they can remember. Compact underwater cameras, if used correctly can take some shots that are very close to cameras that would cost triple their price. Yes a more expensive camera will take better quality pictures but how you edit it can make up a big difference between to two. Compact underwater cameras should have a good battery life available to you. Afterall you are continuously shooting video and taking pictures when snorkeling. The standard in terms of video time should be at least 60 minutes depending on setting. It would be annoying running out of battery life when you are in the middle of yous snorkeling excursion! a good underwater camera should have different settings to work with such as low light settings, 4 K video, wifi capabilities, good shooting speeds (this is crucial for wildlife) data modes and more. This is crucial as this is about snorkeling depth. Before purchasing a camera keep in mind how deep you are going to be diving and where. If you plan on snorkeling a bunch of different areas and you can dive a decent depth get a camera that has capabilities of over 50 feet to be safe. 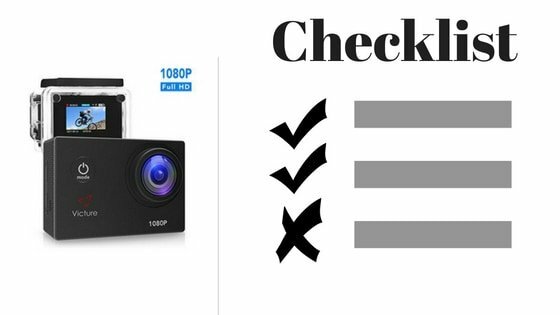 Now obviously if you are buying an action camera for under $100 you will not get the same GoPro kind of footage but there are still cams for under $100 that can have good quality video footage. They should at least have 1080 P resolution with some degree of features built around them. A good quality action camera should have a bunch of different photo shooting modes to choose from. As you go up in price there are typically more modes to choose from. The ODRVM camera is particularly good for this as it allows you to shoot in time lapse, motion detection, car, cycle and driving modes to name a few. This is a crucial one for action cameras. Battery life for video should be at least 30 minutes (preferably at least45) and have a constant on camera time of at least 20 minutes. For a comparison my Activeon CX can last to 45 minutes on video and over 30 minutes continuous in camera mode. I notice that as time goes on action cameras are given more and more accessories to add even at this price range. This is good news for you as I find you often do need extras for everything. An example of this would be my sticky mount that came with my activeon cx camera. Over time it is not so sticky anymore so as a result I have to constantly re-adjust it to my paddle board when I want to record my paddling adventures. For snorkeling purposes look for a camera that has a helmet base. Some snorkeling masks like the Sea View full face mask have a mount that you can attach your camera on to. Even more traditional snorkel masks are starting to adopt this feature as well. The cameras selected do not just excel in underwater use but they can also take pictures in a wide range of different settings and environments both above and below water. The great thing with these cameras is that they can be your all in one go to camera for outdoor use which can save you money in the long run. A few of these cameras also come with extras such as Wifi connectivity, being shock proof, freeze proof to -14 C, GPS, 4K video and more. If you are an adventure seeker, who loves to capture every heart racing moment, the Nikon W300 Waterproof Underwater Digital Camera for snorkeling is naturally your go-to choice. No matter what sport or type of adventure gives you the Adrenalin rush, the W300 Camera makes for a perfect companion. If underwater escapades such snorkeling is your preferred adventure, W300 Camera would be a great idea as it allows you to capture sharp images even at a depth of up to 100 feet. W300 Camera is the safest camera choice as it is dustproof. W300 Camera is shockproof and can fall from a height of up to two and a half meters and has good shutter speed, making it an absolutely perfect choice when going cycling or hiking through mountains. Reviewers said they like the smart placement of buttons, which makes it good for single-handed use. The battery charges rather quickly in a little over two hours. The compact size makes the W300 Camera easily fit in the pocket. W300 Camera offers brilliant video stabilization, dynamic range, and amazing white balance. This camera offers a good wide angle. It works just as fantastic under low light and even when the sky is overcast. Connecting the camera with the phone makes it simple to review and share photographs. Reviewers said they like how the camera works wonderfully underwater with the need for an additional protective case that adds to the bulk of the camera. This makes it a good underwater camera for snorkeling. Some reviewers say the W300 Camera is just as good as big cameras. Photography is an amazing art in itself, but being able to click photographs underwater is even better. That is beyond exotic. The Olympus Tough TG – 5Waterproof Point and Shoot Camera is designed for adventure be it upon the mountains or under the water. Equipped with brilliant features that let you capture great outdoor shots under challenging conditions. The TG – 5 Camera has optimized imaging firepower for capturing the action. It captures brilliant Ultra HD video. The incredibly fast lens allows you to capture shots free of blur and rich in detail. The TG – 5 Digital Waterproof Camera offers a Macro mode that can shoot small objects in a highly magnified scale. The sensors track and record location direction temperature as well as altitude data and click crisp images. The camera comes with an anti-fog lens and the glass is dual-pane so you can capture splendid shots in any environment. This camera is designed to survive anything from you snorkeling in the water to a child playing with it near the pool. You can click fabulous underwater shots. Some reviewers have absolutely loved this camera for underwater shots. Not having to change the battery every now and then, instead just plugging in at the end of the day makes for a hassle-free use. Reviewers have greatly appreciated the microscopic mode as it allows them to capture the finest details of small objects. The TG – 5 Camera is rugged and comes in a size that fits comfortably in your pocket. This quality of compact yet durable has been most valuable to reviewers who seek underwater or snorkeling adventures. Parents with young kids have recommended it for its ease of use and sturdiness. Camera with the red body reflects the light off the body onto the object. If you are looking for a sturdy underwater camera for snorkeling with a great grip, look no further. The Ricoh WG50 Waterproof Camera has a rugged texture that provides excellent grip. The durable design works beautifully under rough conditions making it the best rugged camera. The WG – 50 Camera is packed with features that make it make a perfect companion for adventures. Take it underwater up to 14 meters or use it in low temperatures of up to -10 degrees, the WG – 50 Camera can endure it all. This makes it a perfect underwater camera for snorkeling. With its ruggedized texture, it is highly unlikely to slip out of your hands and fall. But in case that happens, the WG50 Camera is shockproof and can withstand a drop from up to one and a half meters height. Reviewers have found the WG – 50 Camera to be incredibly light in weight. Swimming with this camera is easy due to its compact size and weight. WG – 50 Camera has been lauded for its clarity and the amazing 5x zoom that it has. Reviewers are happy about the straightforward software and ease of use. The sturdiness of the WG – 50 Camera makes it a good choice for industrial use as well. This camera is good value for money. Few reviewers have said that they found the shutter release button too hard and required a little more than depression pressure. 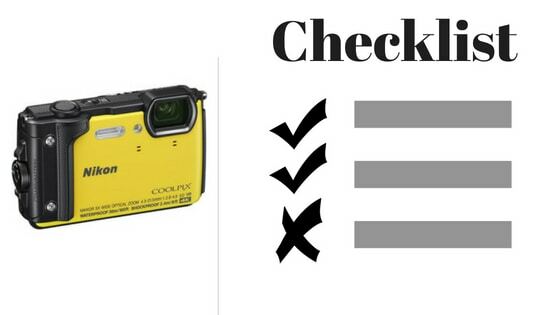 Going on that big snorkeling trip but not needing the camera for anything else? get a cheap underwater camera for snorkeling model! A lot of these cheaper makes are actually action cameras that come with waterproof housings. I myself bought an Activeon CX a few years back and it takes decent footage. Two years, however is like a lifetime in terms of action camera quality and there have been significant advances since I got my Activeon. A lot of these cameras can clip on to full face snorkel masks to boot! All of these disposable action cameras offer more in terms of quality ,price and accessories over the one I got a few years ago. Some accessories and features with these action cameras include: various different mounting systems and straps and housings, 4k videos, 1080P HD quality, wifi and bluetooth capabilities and over an hour of recording time. As the name suggests, Victure Action Underwater Camera is an ideal choice for underwater sports such as scuba diving or snorkeling etc. It also supports attachment to various gears like a bike, helmet, surfboards etc. Rated as the best budget underwater camera, the Victure Camera has a 12-megapixel resolution and Full HD at 1080p ensures that you can capture sharp and high-quality photos and videos with ease. The lens supports a good wide angle range of up to 170 degrees allowing you to capture wider scenes. This camera offers a 2 inch LCD screen so you can enjoy an enhanced visual experience. Photo Burst and Self Timer, Time Lapse and Looping Recording make it very simple and easy to record great videos. Victure Camera works beautifully if you are looking to record while snorkeling. And is equally brilliant when you wish to record subtle yet amazing moments like the blooming of a flower. If you are a part of the action with activities like scuba diving, swimming or snorkeling etc. or just exploring the underwater world, Victure Camera is the perfect companion to take along to capture those wonderful moments. This camera has a sturdy waterproof case that lets you take it up to 30 feet deep underwater. Reviewers, who have used this camera, say that they have found the Victure Camera’s underwater performance to be remarkable making it one of the best waterproof travel cameras available. It is easy to use and easily connects to the smartphone and offers good output options. Supports many functions such as motion detection, time – lapse etc. The Odrvm Camera is a typical action camera that is equipped with a range of features to help you capture photos and videos while snorkeling very aesthetically. Equipped with a 12-megapixel resolution, you can be sure you will get clear photos. All accessories of the Odrvm Camera are waterproof till a depth of 30 meters / 98 feet, enabling you to capture vivid photos and videos underwater. With its anti-shake feature, you can capture stable images free of blur while you are a part of the action in snorkeling. The camera offers various functions such as motion detection and time-lapse. Unusual among this class of cameras, the Odrvm Camera offers a 4 x zoom feature. This camera offers multiple formats for video recording and multiple modes for capturing photographs. The lens has a wide angle of 170 degrees that allows you to capture wider views. The batter of this camera is detachable. Thus it becomes easy to prolong the life of the camera with battery replacements. Also the battery charges within 3 hours. Reviewers have found the Odrvm Camera to be a value for money product. The photo sharing is seamless. The photo and video quality are wonderful so much so that it is on par with expensive high-end cameras. The accessories are well thought of and are everything that you need snorkeling. The CT9000 is packed with various features and multiple functions, making it an excellent choice for activities like snorkeling, surfing, scuba diving, swimming, cycling etc. It is one of the smallest underwater cameras that allows you to capture shots in Ultra HD with the 16-megapixels photo resolution that give you enhanced visual experience as the pictures are sharp and clear. You can capture brilliant shots while you are in action in an outdoor activity as the CT9000 offers attachment on a helmet or can be mounted on a selfie stick or a monopod. This is perfect when you go snorkeling. The waterproof case of this camera can handle the pressure underwater as deep as 30 meters. This means you can enjoy water sports or explore the underwater world without a worry about causing damage to the CT9000 Camera. The camera and its accessories are able to withstand pressure underwater and gave good results in crisp images. Reviewers are happy that the camera comes with a host of accessories and mounts so they didn’t have to spend money on buying things separately. Online reviewers, especially those who seek the thrill of adventure have said the performance of the camera was remarkable when they were snorkeling and scuba-diving. Some reviewers have said that it would be a complete package if the Micro SD card would be provided with the CT9000 camera. Knowing what is dangerous and what isn’t is pretty crucial when taking pictures of wildlife. Its good to get some education on what creatures are dangerous to humans and which are not before jumping into the water head first. get some practice in on land first and really get to know the settings of your new camera as it will be the difference between you getting the shot and not. Keep in mind that if you are diving to take pictures you will be holding your breath underwater meaning you will not have a lot of time to fiddle around with the settings of your camera while underneath the surface. An even better idea is to swim with your camera in the pool so that you can get used to it when snorkeling. Also know the capabilities of your camera so that it does not break due to underwater pressure. While most underwater cameras do give you flash it cannot replicate the light that comes from the surface. Often times your best pictures will come from the surface because the light is better so keep that in mind when shooting wildlife underwater. Ths can make average shot or dull pictures turn out to be great. there are lots of great photo editing software out there like photoshop (photoshop.com) and Corel to name a few. Yes this is an obvious one but often times when you are taking pictures you are so focused on taking the picture that you forget where you are and the whole point of the snorkel trip! Take great underwater pictures but don’t let it take over the reason you are snorkeling! When looking for the best camera for snorkeling you have to decide if you want a digital camera or an action camera. Digital cameras have more settings, better picture quality to play with while action cameras are more compact, cheaper and come with more accessories. If you are looking for digital snorkeling camera that works will in rougher conditions, waterproof to up to 30 meters the Nikon W300 is the top selection. If you are looking for an action camera that is affordable and feature rich the Victure Action Underwater Camera is a great pick.